the pillow for supa is complete. BWAH HAH HAAH HAAH! it’s a little bit evil, a little bit grandma. i learned quite a bit from this project, including how to use the embroidery stitches on my sewing machine. question for the crafty people among you- how do i secure the stitch when i start and end without making it look super crappy? as you can see, i didn’t really know how to achieve that. heh. also, don’t just use aida cloth for your applique when you know very well (young lady) that it isn’t a good idea. just wait for the wool felt you ordered to be delivered and have some patience! tsk tsk. one more! using fabric that has lines on it when you are the laziest sewer in the universe is a very, very good thing. martha would approve. enjoy it supa! if you’d like a similar one, email me with your favorite quote or musing (off-color or not, whatever floats your boat) and general color preferences. i can put them in my etsy shop just for you, which makes it easy to pay with paypal. also look for some new baby items in the shop soon (mama c-ta, i promise to have something to you this week!). This entry was posted on July 24, 2006 at 12:58 pm and is filed under musings. You can follow any responses to this entry through the RSS 2.0 feed. Both comments and pings are currently closed. Very cool! It looks great. I’m impressed at your dedication to completion! You have become my inspiration for crafting…Thanks! I still want to know…when do you sleep? Your jewelry is even more impressive that this amazing pillow. Gah! I love this pillow!! Now I must find a way into Supa’s house to steal it. 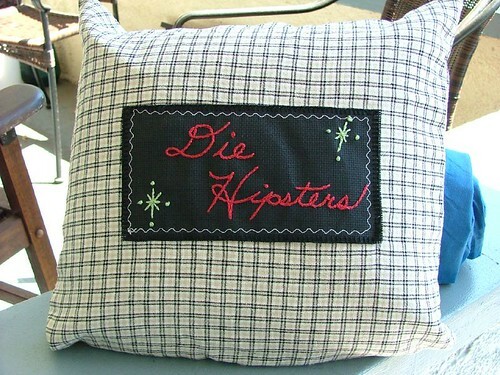 Great design on the pillow. The colors work beautifully together. Love the embroidery. Is all of it done on your machine? It looks great! Hell yes it looks great. You’re so talented. This is the most awesome thing I’ve ever seen in my life. You should sell them to non-hipsters in Brooklyn, because I think this is their sentiment exactly.